Hondata OBDI S300 ECU Systems - PURE Tuning Inc.
A Hondata system consists of additional components which are added to the standard ECU to allow the ECU to use a Hondata program (this modification is normally done by the dealer). 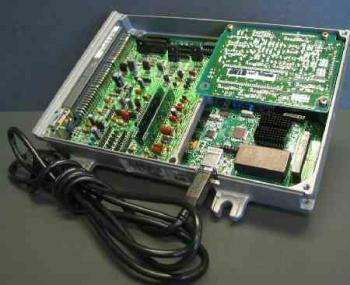 An interface box is then connected to the ECU which contains circuitry for datalogging, stores rev limits and interfaces to switches in the vehicle. Optionally a clutch switch, push button and datalogging cable may be installed. Collectively all this is known as a Hondata system. The s300 uses different connecting pins in the ECU from the s100/s200, and also has a slot cut in the side for the USB connector, so the ECU must be modified for use with the s300. The s300 is made to fit in a full frame ECU case (US and most markets), so will not fit in a JDM ECU case. Fits inside the ECU. No external wiring. Speed limiter removed (if applicable). Tunable fuel and ignition tables. Expanded fuel & ignition tables for boost. Expanded rpm fuel & ignition tables. VTEC control (non user adjustable). Rev limiter (non user adjustable).